It would be impossible--and, I think, pointless--to strip this Marvin Gaye biography of tragedy. An upbeat profile, though unique, would seem false. As much as I'd like to simply rejoice in his gifts, a completer, sadder portrait appears here. Marvin Pentz Gay, Jr. (no "e" yet) came into the world--in the projects of Washington, D.C.--on April 2, 1939. Home was less a sanctuary than a horror: His father, an ordained minister in an extremely austere sect, beat him regularly. Yet the church also represented a blessing, giving the child his first shot as a solo singer. He latched onto drums and organ as still more means for escape. As a young man, post-Air Force, his dedication to music hadn't faded as he doo-wopped alongside the D.C. Tones. Later, he and the Marquees caught the ear of singer (and future Motown producer) Harvey Fuqua in 1958. As Fuqua's latest backup singers, the Moonglows, they moved to Chicago, recorded some singles, hit the touring circuit, and landed in Detroit. There, Berry Gordy took special note of Gaye's expressive, poignant vocals. In 1961, Fuqua's protégé began his storied career with Motown. The company HQ, Hitsville, offered him a new home of sorts. It had both music and a real, often fun family atmosphere. That same year, Marvin Gaye took the family part to a new level by marrying Gordy's sister, Anna. Back to music. His drumming skills came in handy on some Marvelettes and Miracles records. As for his singing, he wanted what Gordy didn't want, which was an album of tender love songs fit for a Nat King Cole or a Perry Como. He got his wish. But The Soulful Moods of Marvin Gaye flamed out. Back he went to the instruments. His prospects got better in 1962 with "A Stubborn Kind of Fellow." That would be a wonderful name for a Marvin Gaye biography--not just a song! It did put him in the Top 50, and he had co-written it with Mickey Stevenson and Gordy's brother, George. Still, he wasn't fond of its R&B flavor. Motown's priorities kept diverging from his. "Pride and Joy" popped into the Top 10, but its sound tied Marvin Gaye to the blues more than ballads. Danceable tunes like "Hitch Hike" were great for young audiences, but not so much for his stage fright. Touring was a chore that he'd later equate with selling out. Duets worked especially well for him. He scored hits with Mary Wells on Together and Kim Weston on "It Takes Two." If I had room in this Marvin Gaye biography for just one of his partners, it would be Tammi Terrell. Ashford and Simpson provided the sparkling songs, like "Your Precious Love" and "Ain't No Mountain High Enough." Marvin Gaye and Tammi Terrell provided the jagged and supple vocals that made them the R&B team to beat from 1967 to 1969. Tragedy, however, eclipsed that period. During a Virginia concert the first year, Terrell buckled into her partner's arms while still onstage. Diagnosis: A brain tumor. She was only in her 20s when she died on March 16, 1970. Her illness and death traumatized Marvin Gaye. 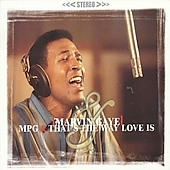 "I Heard It Through the Grapevine" exploded out of the gate in 1968, reaching four million in sales, but he could barely savor his and Motown's success. Depression over Terrell's passing and his imploding marriage factored into his 1970 hiatus from music. Before the public, at least. In 1971, the album that emerged with Marvin Gaye was What's Going On, a jazzy, urbane meditation on politics, social injustice, and the environment. It demonstrated how rich and relevant popular soul music could be, and how well Gaye now embodied an "artist." Masterpiece or not, Berry Gordy didn't expect it to sell. For once, his instincts failed him. Listeners and critics alike embraced the album, although its Grammy snub left Gaye disappointed. The album's biggest bonus? His new artistic freedom at Motown. With the blaxploitation soundtrack Trouble Man and spiritualized carnality of Let's Get It On, Marvin Gaye both expanded into instrumentals and shrank more deeply into himself. Bleaker days now litter the Marvin Gaye biography. His relationship to Anna ruptured for good--or rather, bad. In the mid-1970s, divorce proceedings drained his energy. Even when he returned to the studio, his next effort was a court-ordered album whose earnings would go to his ex. What came forth from the active mind of Marvin Gaye? Here, My Dear, an acidic scrutiny of their marriage. He hadn't forsaken the institution, having just remarried. But he eventually fled to Hawaii to cope with drug addiction, paranoia, and more marital problems. When the IRS came knocking, he left the States completely for England and Belgium. Soon, Motown would no longer be his musical haven. When it released In Our Lifetime with changes he hadn't approved, he severed his ties with the company in 1982. If his life hadn't ended in the '80s, maybe this Marvin Gaye biography would be mourning his decline into has-been-hood. As it was, "Sexual Healing" gave him new success at Columbia. His unusual performance of the national anthem at an NBA All-Star Game left its own mark. By 1984, he was back at his parents' house, fighting his coke habit, depression, and father. After another one of their furious clashes, the father shot the son twice at close range. It was April 1st. The next day was Marvin Gaye's birthday. The impact of Marvin Gaye's music hasn't died. A Commodores tribute ("Nightshift"), induction into the Rock and Roll Hall of Fame in 1987, and ever-more books and Motown/R&B/soul music compilations ensure that that won't happen. Hopefully, this Marvin Gaye biography will help a little, too. Play the hit below by hitting Play. Looking for more content like this Marvin Gaye bio? Please see the homepage for my other Motown oldies artists.